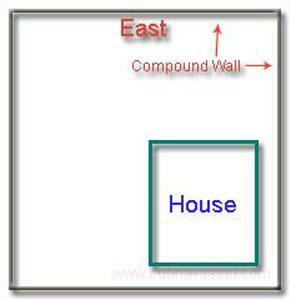 Vastu for home construction: House Structure has to be properly planned as per Vastu shastra. Because if the house construction may weak then vaastu power may also weak. If house construction is robust strong and strength then vastu may also works strong in such structures. Fortunately now a day we have all the information within finger touch, but it will be fruitful only when we utilize all these secrets of powerful vastu shastra with an expert vastu consultant, otherwise residents suffers in their new constructing homes. If one has a good spacious place for construction then he will construct the house as accordingly. The following are the important points noted while at construction of the house. How much you are interested on your property then that much of good results will be the conclusion. Further note that when a resident successfully bought the site then first clean and clear the entire plot first and there after concentrate and start other formalities. Vastu for home construction will be success only with the help of vastu specialist. Residents alone should not do any thing for example: buying the plot or constructing the home etc. Vastu Shastra is the science of house construction. The adherence to Vastu Shastra in the construction of dwelling structures provides prosperity, disease-free and peaceful life all the while. In the case of business structures Vastu Shastra ensures upward prosperity. Architecture and Vastu Shastra are different but co-related. Vastu Shastra is house-craft with a touch of religious rituals. An architect’s job is to build a structure with the facilities suggested by the owner and he cannot ensure prosperity, good health or happiness to the residents. In contrast, Vastu Shastra paves the ways for all these elements. Architecture is a construction act world over, while architecture in India is accompanied by religious thoughts and rituals. Believers in Vastu assert that constructing a house without incorporating Vastu science is highly dangerous as it may result in various life complications and loss of wealth later. When disasters befall one upon one after living in non-Vastu houses, even disbelievers in Vastu are tended to believe in Vastu and adopt corrective steps. Lately, Vastu Shastra has been acknowledged as a priceless gift to mankind. Countries like America, UK, Germany, Japan etc are extensively turning to Vastu Shastra now a days. Though Vastu Shastra is an ancient science it did not get the deserving position in the past due to clever suppression by the ancestors to have the knowledge confined to themselves. The ancestors, however, employed the Vastu science for constructing kingly palaces, temples, religious places and the like. 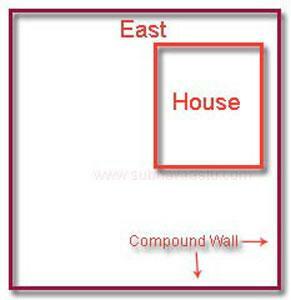 Special care was taken to keep the common man’s houses at bay from the Vastu. 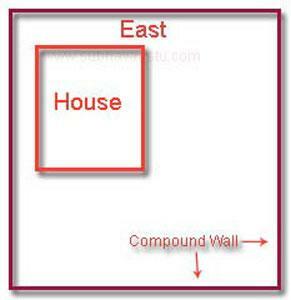 Later, common man got access to the knowledge of Vastu which led to its wide acceptance and utilization. Today, even a small structure is constructed with the concept of Vastu science only. The principles of Vastu act on every object - living and non-living. If enough positive energy is present in every breath our health will remain sturdy and progress vigorously. And if we fail to follow Vastu principles the negative energy increases and we are doomed to suffer. An inauspicious house is not always necessary to have demolished. In most cases, if we add few things the overall positive energy increases and ill-effects get tamed. Vastu Shastra is co-related to horoscope. Astrologers prescribe the type of house depending upon the planetary position. We can change our destiny to a limited extent by following the principles of Vastu Shastra. Many architects do not accept Vastu Shastra as a science. Their ignorance of this vital branch of science is stemmed from the fact that their study materials find no mention of this science. Lately, many universities have realized the value of Vastu Shastra and have incorporated it in the syllabus. While architecture is a technical knowledge directed towards preparation of plan, construction and decoration, Vastu Shastra is related to the universe and it has broad perspective delivering wealth, health and peace to the dweller. Observe this Picture:- In this image with in a compound the house was constructed at Northeast Place, in most of the cases Northeast construction the residents life may fails, don’t plan to construct the home towards Northeast corner in a Compound wall, it may evaporate all the success chances, in most of the cases this construction may be a path for spoiling everything including health and money too and further it may cause for degraded residents prestige, issues in financial problems, health defects, tensions life, defeats etc may occurs, if there is no any compound wall to this house then the problems may not be in such a huge manner further in continuation of this to come out from that hectic situations trees plantation at Southwest parts is wonderful idea. The main concept is North, Northeast and East directions should have more open space than the South, Southwest and West directions, due to this Northeast home consruction, every thing will be flipped here. It may curse the residents. In this image it was clearly shown that a house was built within a compound premises, the house constructed at (Southeast) Agneya Place, it’s a wonderful house for devils, not for the human beings, this type of house construction will collapse the entire system that the residents of the house will spoil all of their chances to live peacefully. Don’t construct the house at Agneya Place at Compound wall, it evaporates all the success chances, this type of construction spoils everything, it may degraded residents prestige, unnecessary quarrels, more tensions in the life, financial problems, health defects, Court matters etc may happen. With this Southeast construction, there should be more open space towards Northwest which brings bad luck to the residents. One has to be taken care when plan to start the construction in a plot. Its always best to show your property with one of the best vastu consultant before planning the construction, he may guide you the rest. House built at Northwest part, basically this is a wrong construction. When deal with Northwest construction residents may experience total mental tortures, heavy losses, pain with entire system, sage thoughts, system failure, leaving the house with pain, court matters, unnecessary disputed matters has to be face and so many and many more other things happens. Don’t construct this type of Northwest house, if resident constructed the same, it wont leave the resident and they has to suffer entire remaining living life, before coming to the results of a property we should first know about is there open space at remaining directions of the compound premises or it was covered with any trees or any other structures. After knowing the facts then only we have to explain the predictions of the property. If there is open space in the other parts of a compound wall then residents may generally face quarrels either indoor or outdoor, having partnership issues, litigation, suffering with disputes, mental tragedy etc, if there is trees in the compound premises then lady is working and male may be in the home, it may not happens with all the homes, but it is also a cause for such feature. This type of house construction helps in increasing the positive energies and reduces the negative energies thereby increasing the positive influence of aggregated result of energies and as such the effect of the same can be felt by the people inhabitation the structure where Vaastu principles have been applied, this type of Southwest house construction always gives the residents more chances for good living and future security and happy leading life. Selecting the area of Southwest for the house construction is a wise thought. This area selection for home construction always benefited residents with peace, entire life satisfaction, victories, money, respectable life, great achievement, development, good name and fame etc. 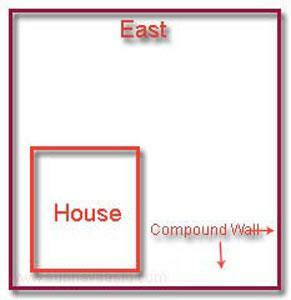 Please note that we are talking about house placement within the compound wall only, we are not saying anything about surroundings of the home. That is why we are recommending residents that better to choose one of the best vastu expert while planning for the house construction or buying a plot/home. In this image one house constructed at Southwest / Nairuthi corner and it has two doors (shown with two arrows), one is at East of Northeast side and another one is North of Northeast side. Generally, Northeast door brings cheers in the house. On the same way the compound wall is also having a entrance door at Northeast-east corner(shown with blue arrow). This is said to be the auspicious compound gate, another gate was also shown at the Northeast-north, this is also one of the best placement generally this may brings money, good health. If you approach one vastu specialist then he provides all these minimum fundamentals and requirements while constructing your dream house, if you buy a house that already built then it is strongly advised that you please consult one experienced vastu master and get his guidance. Please note that Vastu Shastra is definitely works, may be Vaastu consultants may not work, by seeing few Vastu Pandits one may not blame vastu shastra, so don't see the Vastu Specialist fees, choose only the experienced vastu consultant, its nothing but your life may be turning with luck, if residents count Vastu Expert fee separately then they may approach quacks in the market and finally lose their hardship. Based on present income status we may not be built the homes two or three, so one should be careful before construct their dream home, build the house with good vastu then residents may lead satisfied life and days will be more interesting. If the financial structure is very good then it's not a problem, if one house fails then they may shift to another house or may built a new other home, that is a different thing. But in general, nowadays people cannot build many more homes, so our suggestion is built it with good vastu. Vaastu means the physical environment and Shastra means the knowledge. The combine of the two is known as Vaastu Shastra? Which means the knowledge of the physical environment. This ancient science is based on the principles of controlling two basic forces-Positive forces and Negative forces. Any architectural design either brings in some good effects or evil effects on the persons inhabiting the structure. Vaastu as a science is in no way related to performing the rituals before buying or renovating the house. Its a stand alone way of looking at various dimensions for getting the people living in house rid of ill effects of negative forces and provides shield against dreadful diseases, disasters, mishaps, birth of physically and mentally disordered children, untimely death, and other unfortunate happenings. So for your sake the following points have to be kept in mind while planning the construction of a building. In each case, it would be auspicious and beneficial to keep the following points in mind while purchasing a plot or land or constructing a building. The structure of a building needs to be very robust strong for the entire lifetime then some of the points are important to note, if a building is hundred feet tall, its foundation may go down upto 20 feet based on the soil standard. The first brick of the foundation should laid in the North or East part of the house. One should never start digging the plot from the South or west or Southwest. Brick work for the room should start at Southwestern parts. It is very important to check the direction and shape of the plot. A construction on rectangular or square plot is beneficial and good from all aspects. The best shape for a construction on a plot is to be the square type plot. But if we opt for a rectangular shape, the ratio of the two sides should not be more than 2:1, in many cases if the ratio crosses more than this it never harm the inhabitants if they followed vastu principles. Big plots are preferred, as they bring prosperity but they should not have any cracks or cleavage or Bad Street focuses. The plots having a triangular shape are considered inauspicious for construction of a building. A small narrow plot between two big plots is not considered good, because the owner of the building of such plots would remain in trouble. If a plot is rectangular, the length in the East-West direction should be more than that in North-South direction, i.e the East-West axis should be longer than the North-South axis. But this is not a serious problem. Plots should not have more open space in South than in north, because it will lead to destruction and downfall, whether it is in the house or an industry. While constructing the home all the heavy and permanent items should be placed in the Southwest corner of the building or plot. The construction will be easier if the heavy items are placed in the rooms on the southwest or south and west. 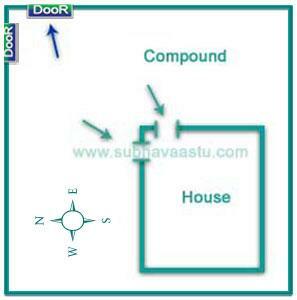 How to know about Vastu for House? Which is the best place for swimming pool? Can I place my God Idols at a corner in my pooja room? How to make money in share market through vastu guidance? I am planning to buy a home, who is the best vastu consultant in Gutur? Where can I get Maa Lakshmi Mantra to have more money, many says it attracts wealth? area 1210 sqft in lucknow gomtinagar,dime nsion is 24.45x49.50 request help with ideas and map. I am planing to construct east facing home.carparking is southeast side. Norheast is a open area.. front compound & parking pillar gap only 2 feet. But backyard gap is 4feet.. Car parking is coverd home plinth sq?? There is old home in front of my house which one is North facing. The area wide is about 18feet. Both side home are from different casts.Whether the land will be suitable for me? Can i built a home for me? Please suggest. There was old home north facing. I am interested to purchase the land. Area wide only 18feet only. Both side having homes of different castes. Please suggest me can i purchase the land? Can i built a home for me? Dear sir our house is already constructed at agneya position of land i.e towarda southeast portion. Please advise me what to do. And we r planning for construction at first floor. I am looking a Villa in 153 Sq. Yds. and having 30 feet parallel road and 30 feet perpendicular road. Plot is facing east-east south. Front is facing 30 degree from east. Road is hitting east side more and left 5 feet front from south side. I am planning to buy a west facing plot. As I have 4 school vans, I can leave vehicle shed only on the south side of my plot. Is it not good to leave space on the south side? Please guide me. Can we take south east side by 1ft to accomidate more space for staircase i.e agni mulle can be taken inside by this house north east side will be 1ft more compare to south east. I have a land with west side road. The size is west-31", north-33", East-31 & South-37". So, pls. guide me for plan a sweet dream home 1 BHK. hi i want to know the step by step guide for construction of my new dream house. please help me.